← What Kind of Exercises Can You Do in Your Senior Years? Have you ever tried an IV therapy before? If you’re not quite familiar with the IV Therapy, it’s time for you to get acquainted with it. Here are four important things you need to know about an IV therapy. When you hear the word “intravenous”, you should always take note of the words “intra” and “vein” being combined. This basically means “into the vein”. Fluids and medications can be transmitted by means of your vein for several reasons. When you become sick or exhausted from a stressful activity, you need to be hydrated. One way to keep the body hydrated is through IV therapy. 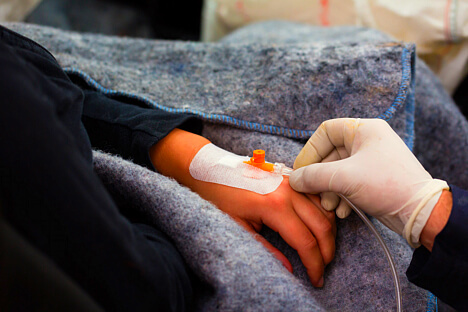 Treatment of an infection through antibiotics, chemotherapy, and relief of pain through certain medications can also permit you to receive the IV therapy. According to www.healthline.com, these fluids consist of water with electrolytes, sugar, or medications added in certain concentrations to improve the state of your health. The rate and quantity of fluids you need also depend on your health condition. A healthcare professional should always supervise the regulation of the fluids being transmitted through IV therapy. Complications might emerge if you receive less or too much fluids. The fluids should be transmitted at the correct rate and amount. There are two types of IV fluid regulation – the electric pump and the manual regulation. Your nurse or some other healthcare professional who is qualified to administer IV therapy can program the pump to deliver the targeted amount of fluid into the IV at the appropriate rate. On the other hand, the manual regulation requires the nurse to increase or to decrease the pressure that the clamp puts on the intravenous tube in order to slow down or to speed up the flow of the fluids. The nurse can count the number of drops per minute to check if the rate of the flow is correct. Before anything else, your doctor will determine the right kind of fluid to transmit to you via IV therapy. Then, the nurse will disinfect the part of your skin that will serve as the injection site. The nurse will locate your vein and inserts an IV catheter into it. When the fluid starts flowing, the nurse will check if it’s flowing correctly and if it’s giving off the right amount. He/she will then come back for IV regulation. The injecting part might be a little painful, but the pain will eventually subside. Complications such as a dislodged IV catheter, collapsed vein, and an infection in the injection site might emerge if you are not careful enough. It is important for you to stay still. Do not pull the IV catheter as well. Alert your nurse if you feel something strange or if you see that the fluid is not dropping from the bag. We will always prioritize your health and safety. Bayou Home Care offers Home Care in Louisiana. We strive to do everything in our capacity to serve you with quality home care services. For inquiries, feel free to call us at any of our contact numbers: 985-252-0040 (Pierre Part) or 504-835-0101 (Metairie). This entry was posted in Home Care and tagged burn pain, companionship, elder, elderly care, exercise, heart attack, home care, home care in louisiana, home health, homemaking, Intravenous Therapy, IV therapy, personal care. Bookmark the permalink.